From a lavish affair at a cathedral to a small intimate gathering of friends. From the formal and traditional ceremony to piping a bride into a tee-pee with dogs as ring-bearers: your wedding is as unique as you are! I’ve been part of weddings for over 20 years locally, interstate and overseas and really enjoy being part it all. 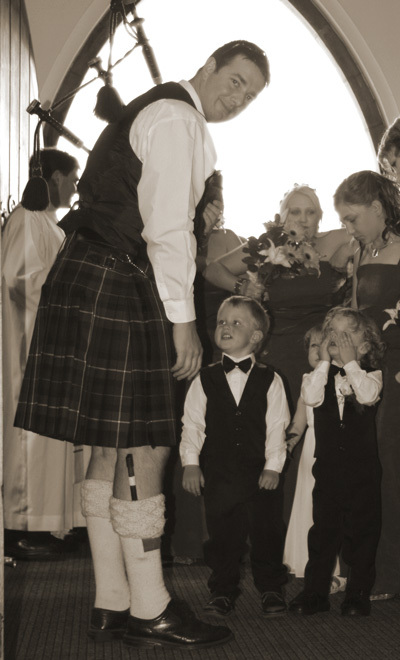 The first thing you should know, however, is that there is no such thing as a “Traditional Scottish Wedding”. I have played bagpipes for hundreds of weddings and each and every wedding I have done has been unique. Talk to me about what you’ve got in mind. It’s your wedding and no idea is too traditional or too off the wall. Or, if you’re stuck for ideas, but you just know you have to have bagpipes, I can offer some ideas, too.